The eponymous Graff Diamonds Company was founded in 1960 by Laurence Graff and soon became known as one of the premier diamond houses of the world. He was principally known only to most rarefied of buyers such as the Sultan of Brunei, Elizabeth Taylor, members of the Royal House of Saud, and an assortment of billionaires. As such, Mr. Graff has held some of the most expensive colored diamonds, such as the Graff Pink. Since its establishment, the firm has become known for truly exquisite designs and as a source for some of the most significant stones in existence. However, it first came to public notoriety in 2008, when Mr. Graff purchased the Wittelsbach Blue Diamond. Once part of the Austrian and Bavarian crown jewels, this stone (at that time) received the highest price ever paid for diamond at auction. 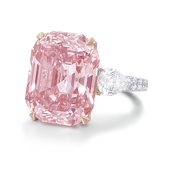 The Graff Pink, once owned by Harry Winston as a part of his private collection, resided out of the public eye for 60 years before being put up for auction in 2010. Originally estimated to fetch between the $27 million and $38 million, Laurence Graff purchased the stone at Sotheby’s Magnificent Jewels Sale in Geneva for a record-setting $46 million, making it among the most expensive single jewels ever publicly sold. Upon purchase, the diamond would immediately be christened as the Graff Pink. 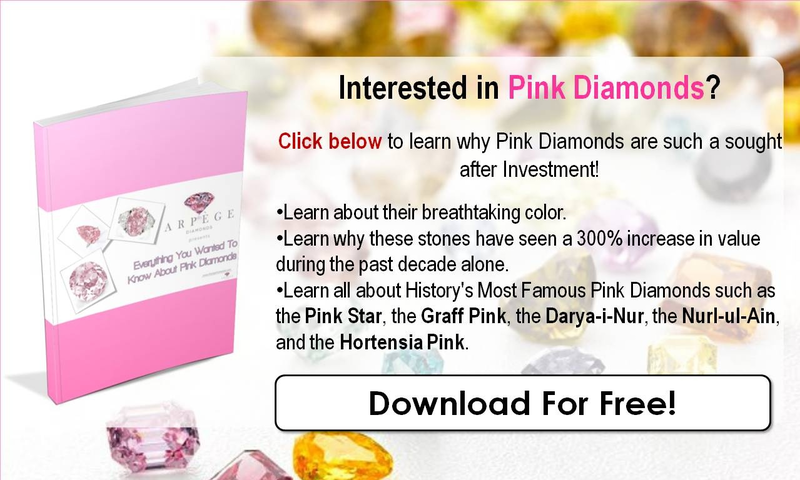 Why Is This Pink Diamond So Special? Pink diamonds are among the rarest of stones, and the Graff Pink is a very special stone indeed. You will not find many of them above five carats and many never even achieve gem quality. As purchased, the Type IIa classified stone had a weight of 24.78 carats and a color rating of fancy intense pink by the GIA. Though these stones can be free of impurities, the diamond exhibited 25 natural flaws that Laurence Graff felt could be removed without compromising the integrity of the diamond while also heightening the intensity of the color. While there were tremendous risks connected to re-cutting the stone, with all of his experience, Mr. Graff decided it could be done. The identities of diamond cutters are closely guarded, as are their secrets. Modern diamond cutting combines the latest technology with millennia-old knowledge, to achieve the most perfect cuts in order to showcase brilliance of a flawless gem. No one can contest that after the stone was re-cut, there were few superlatives left to describe it. It had become a true piece of art. While the stone was trimmed from 24.78 carats down to 23.88 carats, the color was heightened from intense to vivid and the clarity of the stone to internally flawless. The rectangular cut, 23.88 carat, Internally Flawless, Vivid Pink remained the record holder for the most expensive pink diamond ever to be sold at a public auction until 2017 when the Pink Star came to rise. For more famous diamonds and investment tips see the links below and as always feel free to follow us on Twitter and LinkedIn.